Shown on the above CD cover are Teddy Bears’ lead singer Annette Kleinbard and a young Phil Spector, right, author of their 1958 hit song, “To Know Him is To Love Him.” Click for Greatest Hits CD. In 2010, a song written more than 50 years earlier by rock ‘n roll legend, Phil Spector, for his group The Teddy Bears, began to be used in a sweetly-portrayed Humana Health Care TV ad pitching senior health care. Spector, the famous rock ‘n roll music producer noted for his lavish “wall-of-sound” studio productions of the 1960s, was also a controversial figure. In 2009, he was convicted of second-degree murder in the shooting death of actress Lana Clarkson. The song Spector penned and performed as a member of the singing group, The Teddy Bears, pictured above, became a No. 1 hit and a million-seller in late 1958. This was a time when a certain kind of soft rock sound was momentarily popular, as a few groups with gentle-sounding ballads, such as The Fleetwoods with “Come Softly To Me” and “Mr. Blue,” had big hits then. But how and why this Teddy Bears song by Phil Spector was chosen by Humana in 2010 for marketing its services is an interesting question — more on that in a moment. First, a little history on song and author. Young Phil Spector with Teddy Bears photo behind him, 1958. Some sources have Phil Spector’s birth date as Christmas Day 1940 (Rolling Stone Encyclopedia of Rock & Roll), others as December 26, 1939. He grew up in a lower middle class Jewish family in the Bronx. His grandfather had emigrated from Russia with the surname “Spekter.” Young Phil’s childhood was rocked by his father’s suicide in 1949. He and his mother moved to Los Angeles, California four years later, in 1953. In L.A., Spector became involved with music, learned the guitar, and by 16 had performed at a talent show at Fairfax High School and joined a loosely knit community of aspiring musicians in the area. With three friends from high school — Marshall Lieb, Harvey Goldstein, and singer Annette Kleinbard — Spector formed a group named The Teddy Bears, a name derived from an Elvis Presley song. Spector, meanwhile, had spent some of his teen years visiting local recording studios and came to know record producer Stan Ross, co-owner of Gold Star Studios in Hollywood/Los Angeles. Ross introduced young Phil to the craft of record production, and tutored him a bit. The Teddy Bears’ song, “To Know Him, Is To Love Him,” was a No. 1 hit in December 1958, and also a million-seller. Click for digital version. Dore, meanwhile, mailed out 500 copies of the single to radio stations in early August 1958. But with no great initial reaction to the recording, two members of the group, Goldstein and Leib, returned to college. However, that September, a disc jockey in Fargo, North Dakota flipped over the record and began playing “To Know Him Is to Love Him.” Soon an order came into the Dore offices from a Minneapolis distributor requesting 18,000 copies. Within a week, the song was on the national music charts and the Teddy Bears were invited to appear on American Bandstand on October 29, 1958. After the Bandstand appearance, “To Know Him Is to Love Him” went on to become the No. 1 pop song in the nation, topping the Billboard singles chart for three weeks beginning December 1st, 1958. It sold more than a million copies before Christmas that year. The Teddy Bears, meanwhile, rode their momentary fame to other TV appearances, also booking, for example, on The Perry Como Show January 3, 1959. Phil Spector, shown later, in the control room of a music studio, where he would become a rock ‘n roll maestro. The Teddy Bears, it turns out, were something of a short-lived venture for Spector, who became a renowned music producer famous for his 1960s’ “wall-of-sound” rock ‘n roll creations — songs he powered with lush studio instrumentation for famous acts such as the Ronettes, the Crystals, Ben E. King, Tina Turner, the Righteous Brothers and others. In later life Spector also produced for the Beatles. Phil Spector the person, however, is quite another story, whose private life has been widely written about elsewhere. In 2009, after two trials, he was convicted of second-degree murder of Lana Clarkson, a struggling 40-year-old actress, and is presently serving a sentence of 19 years to life. As for the other members of the Teddy Bears, Marshall Leib became a musician and producer of other artists, including the Everly Brothers. He also supervised music for films. Annette Kleinbard, in a 1960s auto accident, suffered severe facial injuries. However, after recovering, she changed her name to Carol Connors and went on to write and/or co-write a number of hit songs and also film music, including the hit theme song for the first Rocky movie, “Gonna Fly Now” and also the Billy Preston/Syreeta Wright song, “With You I’m Born Again.” Decades later, meanwhile, in 2010, the Teddy Bears’ song “To Know Him is To Love Him” was resurrected in a Humana television commercial. A Humana Insurance Co. logo. The final screen shot includes the word Humana, with phone number (available 8 a.m. to 8 p.m., seven days a week) and the web address, Humana-Medicare.com. Screen shot from Humana's 2010 "Grandparents" TV ad. Similar comments are posted on YouTube pages where the ad has appeared. A few, however, have also noted the Spector connection, some disapproving. Humana, in any case, was still featuring the ad at the top of its website as of December 2010. The 1991 Phil Spector “Back To Mono” 3-disc boxed CD set features 60 songs he produced from 1958-to-1969. Click for CD set. The song being used in the Humana ad, however, is not the Teddy Bears’ version, but is a “cover version” of their song performed by a British artist named StickBoy. Still, Phil Spector is the songwriter and is entitled — according to law and conventional practice — to the songwriters’ share of the royalties every time the song is played, regardless of who performs it. Phil Spector in recording studio, circa 1960s, with engineer Larry Levine, seated. In Phil Spector’s case, royalties and author/publisher fees are apparently still flowing to his companies while he is in jail. Reportedly, Spector regularly phones his fourth wife, Rachelle, who he married in 2006 when she was 23 and he 62. They met at a Hollywood nightclub in September 2003. Rachelle lives in Spector’s former mansion and now runs the companies that collect his musical royalties. In May 2010, Spector also released an album featuring his new wife’s music that he had produced earlier. Meanwhile, he continues to claim his innocence in the murder of Clarkson, saying she committed suicide. Phil Spector, in sunglasses, mid-1960s, with the Rolling Stones, having helped them on their debut album. In 2010, a documentary film on Spector and lengthy 2007 interview with him, titled The Agony and The Ecstasy of Phil Spector, was released by director Vikram Jayanti. In late March 2013, an HBO film aired under the title Phil Spector, starring Al Pacino as Spector and Helen Mirren as defense attorney Linda Kenney Baden. The film, based on Spector’s career, focused primarily on the relationship between Spector and his defense attorney during his murder trials for the 2003 shooting death of Lana Clarkson at Spector’s California mansion. The film received mixed to positive reviews. Other stories at this website involving Phil Spector’s music career, his hit songs, and/or groups he worked with include: “Be My Baby” (his 1960s work with The Ronettes and his relationship with the group’s lead singer, Ronnie Bennett Spector); “Lost That Lovin’ Feelin’”(his work with the Righteous Brothers’ in the mid-1960s); “Rocker Supreme” (his work with Tina Turner on one 1960s song ); and “1960s Girl Groups” (his work with the Crystals, Darlene Love, and Brill Building songwriters in the 1960s). Thanks for visiting – and if you like what you find here, please make a donation to help support the research and writing at this website. Thank you. – Jack Doyle. DVD cover of March 2013 HBO film, "Phil Spector," starring Al Pacino and Helen Mirren. 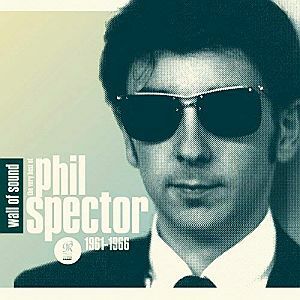 2011 CD by Legacy Recordings, “Wall Of Sound: The Very Best Of Phil Spector 1961-1966”. Nick Cohn, “Phi Spector,” in Anthony De Curtis and James Henke (eds), The Rolling Stone Illustrated History of Rock & Roll, Random House, New York, 1992, pp. 177-188. “To Know Him Is To Love Him,” Wikipedia.org. Charlie Moran, Songs for Soap, “Should We License Songs From Musicians With Questionable Personal Lives? Gary Glitter Song in New HP Ad Touches Off Criticism,” Advertising Age, October 29, 2008. Video of the Teddy Bears performing the original version of “To Know Him is To Love Him,” on Ed Sullivan’s Toast of the Town TV show, 1958, at: The Oldies TV Video Jukebox. Guy Adams, “A Wall of Sound From Behind Bars as Spector Releases New Album,” The Independent (London, U.K.), Sunday, 30 May 2010. Michael O’ Sullivan, “Composed Yet Confound-ing,” Washington Post, December 17, 2010. Review of documentary film, The Agony and The Ecstacy of Phil Spector, 2010, Vikram Jayanti, director. Roger Ebert, Review of HBO Film, “Phil Spector,” RogerEbert.com, March 20, 2013. Jack Doyle, “Be My Baby, 1960s-2010” (Ronettes’ bio & music history), Pop HistoryDig.com, January 18, 2010. Jack Doyle, “Lost That Lovin’ Feelin’,”1964-1965” (Righteous Brothers’ music history), PopHistory Dig.com, August 31, 2008. Jack Doyle, “Rocker Supreme, 1958-2007” ( Tina Turner bio & music history), PopHistory Dig.com, April 18, 2008. Jack Doyle, “1960s Girl Groups, 1958-1966,” PopHistoryDig.com, June 25, 2013 (overview of girl group pop music genre with 18 embedded songs featuring groups such as: Shirelles, Ronettes, Crystals and more).